After breakfast, proceed to Kargil via Srinagar Leh Highway. Enjoy a short halt at Sonmarg (Known as gateway to Ladakh & the Meadow of Gold) to admire the views. One can enjoy a pony ride to Thajiwas glacier. Notice the gradual change in the colours of the mountains as you travel to Kargil. Cross the Zozilla pass & Drass region. Visit the Zozilla War memorial & Kargil War memorial on the way to pay tribute to the Indian Army. It was in this very region in which the Indian Army fought and won the famous war of Kargil. 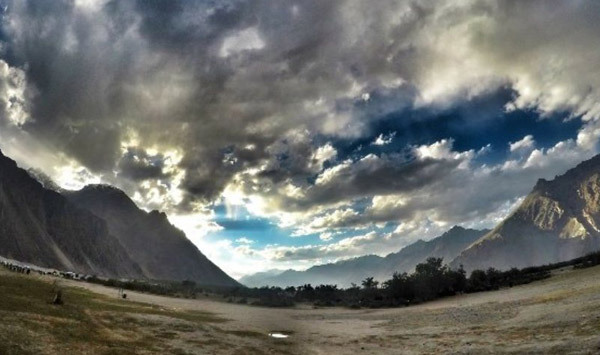 Take some memorable snaps of Tololing, Tiger Hill and the war memorial in Drass. Overnight stay in Kargil. After an early breakfast, proceed to Leh. En route, visit Mulbek (known for its huge Buddha Statue) and Lamayuru monastery (The oldest monastery in Ladakh). Admire the confluence of Indus – Zanskar Rivers and the effects of Magnetic Hill (Defiance of the law of gravity). Visit Gurudwara Patthar Sahib and Kali Mata temple and reach Leh in the evening. Overnight stay in Leh. After an early breakfast, visit sightseeing places like Shey, Thiksey, Hemis and Sindhu Ghat and then proceed to Pangong via Changla Pass (17,586 feet) and the third highest pass of the world. Pangong Lake is a salt water body of 120 km in length and 6 – 7 Km broad at the longest point. It is bisected by the international border between India & China (2/3 of the lake is in China’s possession). Visit the exact location of the famous movie “Three idiots” & enjoy outing along the banks of the lake. One really feels very close to nature at Pangong Lake with its scenic surroundings. On a clear sunny day, you can see seven colour formations in the crystal clear salt water lake. Overnight stay in Pangon. After breakfast, visit Diskit & Hunder Villages and monasteries take a stroll around the place to see the life style of people living at the northernmost region of India. Drive back to leh via Khardungla pass. Overnight Stay In Leh.